This episode is so heartwarming; I love how the scriptwriter wrote the story on how Shi-on gets encouraged by his deceased hyung. That could be Shi-on imagination but that is enough to bring tears in my eyes. His colleagues residents were supportive of Shi-on and even gave him a thumb up for the surgery he performed was simply great. They are looking at Shi-on just the way he is, they befriend with him and overlook his disability. 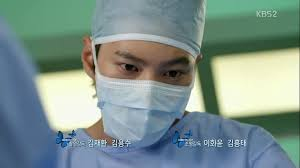 I was so touched by Do-Han because he begins to appreciate Shi-on gift (talent) and willing to give him a chance to be a doctor. The transition from fear, suspicious to acceptance was really well done. Bravo to the actors for their great performances. I like Shi-on and Yoon Seo interaction too. I keep laughing when Yoon-Seo asks Shi-on whether he can see through his body parts like an X-ray. Shi-on looked at her and say, “who in the world has this type of ability?" His reaction was really funny when he turned shy and laughed; after all he is a man. :) I find that those moments of interaction were lively and cute. Do-Han is becoming like a mentor or a hyung (big brother) to Shi-on now. I like the basketball scene where Do-Han talked to Shi-on and I noticed a different attitude on his part.